Find answers here to the most frequent questions about services offered by BLE Executive and Virtual Suites LLC. How does a Virtual Receptionist differ from Telephone Answering Service? Our goal when answering your phones is to make it seem like we are your receptionist, like we are an extension of your business. We want to know about your business, what it does and how it operates so that we can assist your callers and get them the results they expect - for example when a caller asks, "what does your business does do?" Do you really want your receptionist to say I'm sorry I'm just the receptionist let me transfer your call? During our orientation period we go through your procedures to ensure we understand these basic questions about your business and handle callers in the manner you expect. After all we are commonly the first point of contact between you and that potential new client. Why should I sign up a Virtual Receptionist? Sometimes you are not able to answer your phone – you are in a meeting, working to meet a deadline or on vacation – and the caller doesn't want to leave a voicemail. Missed calls can be a missed opportunity. Our receptionists will ensure you never miss another call. We can also serve as backup for an existing receptionist by having phones forwarded to us to cover for breaks, lunch, vacation or sickness. What is the cost of a missed call? At some point hiring a receptionist becomes less of a luxury and more of a necessity in order for a small business to maximize its productivity. Mail or parcels received at the address of the virtual office are stored privately until you pick-up delivered packages. For a modest additional fee, we can forward your mail to you, or you can designate someone to retrieve it for you. What do I get with the Mailbox/Business Address Package? Using our address as your official business address has several advantages. First it's the address your customers find when they Google your business and see on your business cards. We will handle all your mail services including receipt of mail and courier packages as well as be a drop off location between you and your clients. More importantly it keeps your personal information confidential from your customers and suppliers as they no longer have access to your home location. A Virtual Office provides office services specifically designed to meet the needs of today’s remote worker. A growing percentage of today’s workforce do not have a full-time office as they are frequently travelling, meeting clients or simply working from home. And they don't want to pay for an office they don't use? The virtual office concept was designed to accommodate this group by providing services such as (i) a professional business address to help improve a company's image; (ii) access to fully equipped offices and meeting rooms on an as-needed basis, (iii) customized phone reception service with phones answered in their company name and calls handled exactly the way they want, and (iv) administrative services such as appointment taking, scheduling, word processing and more. Why should I have a Virtual Office? Virtual office services allow business owners to focus on growing sales and other important aspects of their business without the worry about the administrative matters. 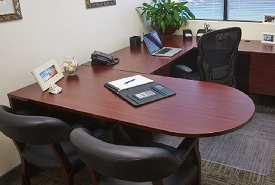 The virtual office is a low risk and cost effective way to establish a corporate presence. It projects professional image. What do your prospective customers find when they Google your business? Your home address? A PO Box? Using a home address may be acceptable when you first start up however it may not work as well as your business grows and you pitch larger clients and bigger contracts. Having a prestigious business address for your website and business cards will help give prospective customers the comfort they are looking for. It saves you time. One advantage of using our business address is that you have your mail and courier packages sent to this address - there is no more waiting around for a FedEx package to arrive. We are at the office so you don't have to be. Our receptionists can also look after your scheduling and take care of other administrative matters as needed. It lowers overhead costs and reduces business risk. The two largest expenses for small businesses are rent and personnel. Virtual offices can help significantly reduce both. A traditional office requires rental of space, the purchase of furniture & fixtures and setting up phones, internet service and building maintenance. It’s expensive and takes up significant time both upfront and on an ongoing basis. Furthermore upfront expenditures, long term lease commitments and hiring new personnel significantly increase the company's business risk.